Yakuza Kiwami 2 (henceforth Kiwami 2) is a remake of Yakuza 2 for the PS4. Kiwami 2 is an absolute monstrosity of concepts thrown together, but executed in such an elegant and wonderful manner. It’s just like a brawler and an RPG combined, but add WarioWare. Also, remove the vast majority of the microgames from WarioWare, but then add considerable depth to the remaining ones. Also, add WAY more depth to some of those games, resulting in several hours of additional gameplay each. Finally, that RPG part I mentioned earlier is really a JRPG, so add way more narrative. See the combat going on? That represents about 1/20 of what is available in the game. The story takes place across a couple of cities in Japan amidst the early 2000’s. 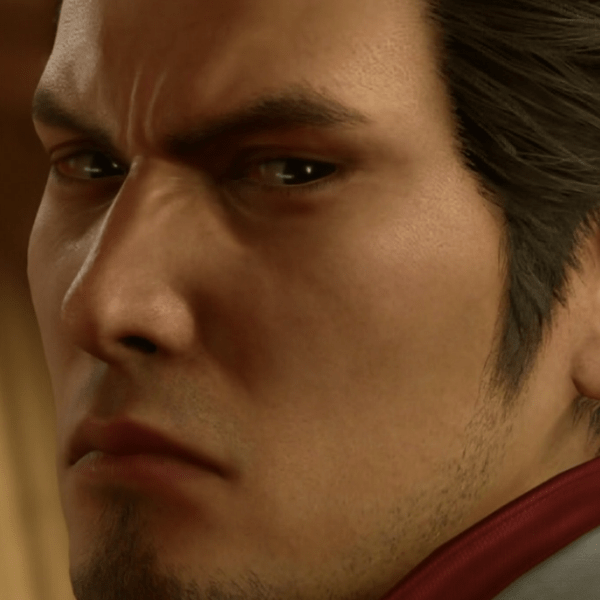 Our protagonist, ex-Yakuza Kazuma Kiryu, who has both a heart of gold and the single most powerful brow ever, bears witness to the assassination of a Chairman from his former clan. The Chairman’s dying wish is to prevent all-out war between two clans, so Kiryu sets out to make the wish a reality. Of course, things get a little complicated on the way. Discussing these complications would place this review into spoiler territory. Kiryu disapproves of spoilers. The main gameplay loop involves walking around a city, meeting new folks, and solving their problems. Walking around the city is interrupted up by combat, as various delinquents and ill-mannered parties are quickly introduced to the fist of Kiryu-san. Combat consists of stringing together combos of weak and strong attacks while blocking and dodging the swings your opponents throw. The fights themselves are reminiscent of gameplay from your typical brawler mixed with something from the Dynasty Warriors series, as you’ll frequently be outnumbered in a fight. You also have a Heat Meter that slowly builds as you hit your opponents. Once the meter reaches a certain point, you can perform a Heat Action. These are typically very strong attacks that features an awesome cutscene of Kiryu finding new and exciting ways to hurt the opponent. For the most part minigames are optional, so if you can’t stand one of them (I’m such a scrub at mahjong) you can safely ignore it. If you can stick with it, you’ll be rewarded with yen, EXP, and other useful items that can be used elsewhere. The main takeaway is that there are so many things to do in this game, any given play session could be completely different from the last. Beyond the main plot, there are quite a few “sub-stories.” These are basically side quests that introduce new characters, mini-games, and provide numerous rewards such as consumables. The vast majority of these sub-stories are simple in scope, meaning they can be completed by simply returning to a character at a later point in time. Most are a bit more elaborate, and may require you to visit multiple locations, try out a minigame, or accomplish some other task. The sub-stories are generally unrelated to the main plot, but these rewards are usually worth your time. Seriously. Look at that brow. It radiates power. The tone of the main story is dire, which is completely subverted by the wacky tone presented in the sub-stories. Sub-stories typically feature humorous dialog and situations, which provides a comedic reprieve from the sterner main plot. These sub-stories have Kiryu procuring an energy drink for an exhausted construction worker, giving a convenience clerk a pep-talk, and spending some time playing a claw machine game so some schlub can give the prize to his would-be girlfriend. The competing tones provide a sort of ebb and flow to the overall mood of the game. Allowing allowing the player to tweak its flavor. Need a break from the struggles in the main story? Go buy a clean set of underwear for that fella stuck in a public restroom. Ready to get back to business? Head to the next main task marker on the map. Remember that angry looking guy up above? Yep, this is him again. The sound design of Kiwami 2 is well paced, although seemingly schizophrenic. Ambient sound effects when walking through the cities are immersive, but quickly give way to wailing electric guitars during combat. The music perfectly reflects the current state of the game: frantic when excitement is abound, practically non-existent when the pace slows down. Like a helpful waiter, it’s there when you need it, and quickly gets out of the way when it’s not. On the other hand, animations suffer greatly when transitioning between combat/FMV and dialog boxes. During combat and FMV sequences, characters move with fluidity and grace. You can feel Kiryu’s when he slams a delinquent into a wall. Excitement abounds whens he sings from the heart during a karaoke session. However, this ends abruptly when a dialog box appears, turning our energetic characters into mannequins with flapping mouths. The transition is incredibly jarring, and sticks out as a sore thumb. Welcome to the gun sho-WHOA! Check out the sweet bike! I mentioned RPG elements, which means that Kiryu can purchase upgrades with EXP. These upgrades provide various bonuses, such as more health, new attacks, and other quality of life bonuses. There are several different colors of EXP, and different upgrades require different amounts and combinations of EXP. You get EXP from reaching milestones in the main quest, completing sub-stories, fighting hooligans, and eating. Yes, eating is also a mechanic in this game. But it’s quick, provides you with the aforementioned EXP, and restores Kiryu’s health. There really is a lot to Kiwami 2. At times it can seem like multiple games were combined into one. However, the wealth of options in the game is really a large part of its charm: the game constantly throws new mechanics and activities at the player, and it’s always exciting to find these new nuggets of gameplay gold. Every time I thought I grasped the full scope of the game, something new came along. There’s an in-game completion list with 303 things to do! So many activities! If this is your first foray into the series, then you’re weird for starting on number 2 and should feel bad. Don’t worry, though: a comprehensive summary at Kiwami 2’s beginning fills you in on the previous game’s events. However you’ll likely be too wrapped up in the current game’s story and tasks to be overly concerned. Regardless of where in the series you choose to dive in, Kiwami 2 is a marvelous game, with almost too much content, but just the right amount of charm. Exploring the sprawling cities is a blast!